Yet another soup recipe! I told you I’ve been craving soups this pregnancy. My husband and daughter love tacos and always ask me to make them. Everytime I make them, they inhale the entire batch and there’s never anything leftover for lunch the next day. 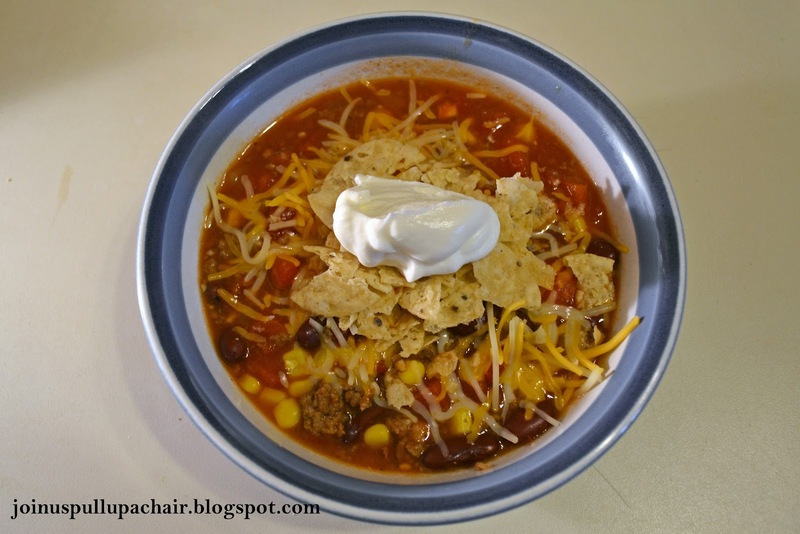 I saw this soup and thought it would be perfect to have enough for dinner and lunch leftovers. Not only did it give me dinner for the three of us and 4 servings for lunch, I was able to freeze about half of it for another time. I know it will definitely come in handy when I’m huge and not feeling like spending time in the kitchen cooking. Just a quick update on my pregnancy – I’m 26 weeks and doing well. I’ve been feeling pretty good, but definitely slowing down and feeling the need to rest more often. Baby boy is quite active and I’m always feeling kicks and bumps. He’s still not named, but we’ve been making progress on his nursery and will be ready for his arrival in June. In a large soup pot, brown the beef, onions and garlic. Drain any grease once the meat is completely browned. Add the taco seasoning and 1 cup of water. Stir to combine well. Add the remaining ingredients including the remaining 2 cups of water. Bring the soup to a boil. Cover and reduce heat to medium low. Simmer for at least 15 minutes until ready to be served. Spoon into bowls and top with your desired toppings. I used shredded monterey jack cheese, crushed tortilla chips and sour cream.